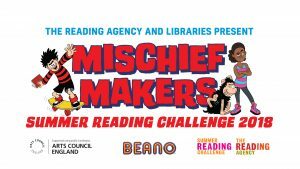 The Summer Reading Challenge is here once again, and this year the theme is Mischief Makers! This year we’re headed to Beanotown to help Dennis the Menace and friends find a hidden treasure chest full of pranks. Joining in with the fun is easy. Step one: be a child aged 4-11 (sorry grown ups!) step two: read six books over the summer holidays. For every two books you read, you will receive a reward pack with special prizes and clues to the location of the buried treasure. When you return your sixth and final book, you will be rewarded with a certificate and a shiny medal! Step three: wear your medal with pride! The challenge starts today (14th July) and you have until the 15th September to complete it. So what are you waiting for? Get down to the library and read your first two books now!